The Russell did not post a big gain, but it was 1% and a new leg higher. 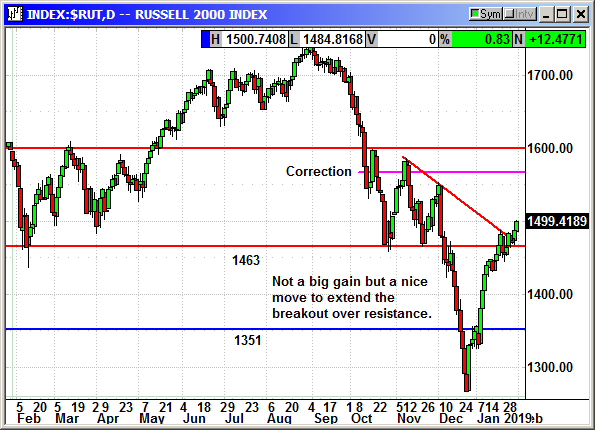 The Russell broke out of congestive resistance and consolidation at 1,462-1,493 and moved convincingly higher. This could be the start of something good. If the broader market can shake off Amazon's earnings drop, and close positive again we could be headed significantly higher. 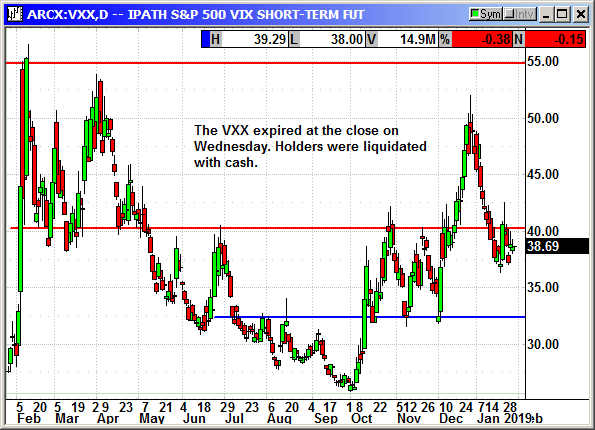 The short position was closed when the VXX expired. The long call position was stopped at the open. 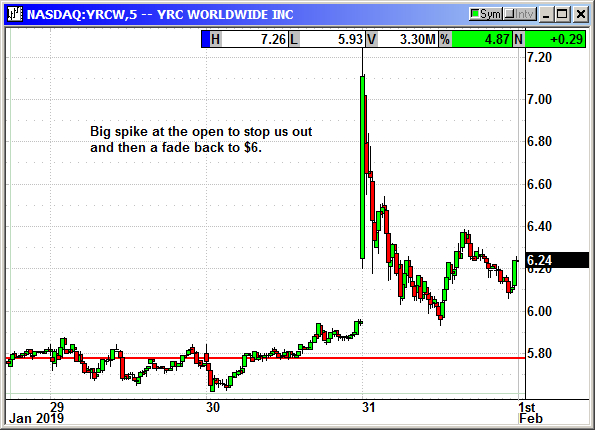 YRCW reported earnings of 6 cents that missed estimates for 12 cents. That was still a 50% increase from the year ago quarter. Revenues of $1.25 billion beat estimates by a fraction. Shares spiked to $7.26 at the open before fading back to $6. I messed up on this position. I recommended the position with no stop losses on either side. However, somewhere in the transposition to the portfolio graphic I inadvertently added a $6.65 stop loss to the call. That means we were stopped out of the call side at the open. Even though it was not supposed to be there, I have to take the exit because that is what was in the newsletter. The long put has no value today but YRCW missed estimates. If the market was not so bullish, we could have seen the stock head back towards the lows. I am recommending we keep the put and see if the recent gains begin to erode. Original Trade Description: Jan 26th. YRC Worldwide Inc., through its subsidiaries, provides various transportation services primarily in North America. Its YRC Freight segment offers various services to transport industrial, commercial, and retail goods; and provides specialized services, including guaranteed expedited services, time-specific deliveries, cross-border services, coast-to-coast air delivery, product returns, temperature-sensitive shipment protection, and government material shipments. It serves manufacturing, wholesale, retail, and government customers. As of December 31, 2017, this segment had a fleet of approximately 7,600 tractors comprising 5,900 owned and 1,700 leased; and 30,900 trailers consisting of 23,800 owned and 7,100 leased. The company's Regional Transportation segment provides regional delivery services, which include next-day local area delivery and second-day services, consolidation/distribution services, protect-from-freezing and hazardous materials handling, truck loading, and other specialized offerings; guaranteed and expedited delivery services consisting of day-definite, hour-definite, and time definite capabilities; interregional delivery services; and cross-border delivery services, as well as operates hollandregional.com, newpenn.com, and reddawayregional.com, which are e-commerce Websites offering online resources to manage transportation activities. This segment had a fleet of approximately 6,500 tractors, including 4,700 owned and 1,800 leased; and 13,700 trailers comprising 10,500 owned and 3,200 leased. The company was formerly known as Yellow Roadway Corporation and changed its name to YRC Worldwide Inc. in January 2006. YRC Worldwide Inc. was founded in 1924 and is headquartered in Overland Park, Kansas. Company description from FinViz.com. YRCW has a problem with earnings reports. They either gap up or gap down immediately afterwards. Their performance has been so spotty on earnings there is no accurate expectation of what they will report. The stock is cheap at $5.75. Over the last two weeks shares have risen to that level from the December market crash and have plateaued there with no further movement. For any normal stock this would appear to be staging for a post earnings breakout. Since the options are so cheap, I am recommending a combination play where we buy a cheap option on either side of the stock price and hope for a strong move in either direction. 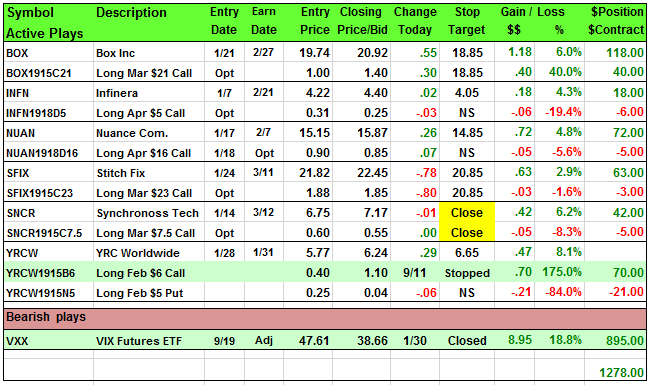 Closed 1/31: Long Feb $6 call @ 40 cents, exit $1.10, +.70 gain. Long Feb $5 put @ 25 cents, no stop loss. Now I know why there was no decline on the VXX on Thursday. The ETN expired at the close on Wednesday. Holders were liquidated in cash at the $38.66 closing price. The VXX was a 10-year ETN created by Barclays. Wednesday was the expiration. Barclays has replaced it with the exact same product only with a 30 year expiration and the symbol is VXXB. I am recommending a new position in that ETN today. Closed 1/30: Entry $47.61, exit $38.66, +$8.95 gain.